I was not expecting this – there are a lot of vegans in West Africa. I started looking in Burkina Faso, and discovered a busy restaurant serving all-vegan versions of West African dishes. This is no specialist upmarket outlet catering to foreigners or tourists – just good healthy food for local people in Ouagadougou. I missed out on visiting a vegan place that is listed in Kumasi on HappyCow.net due to the horrendous traffic and poor road conditions approaching the city. 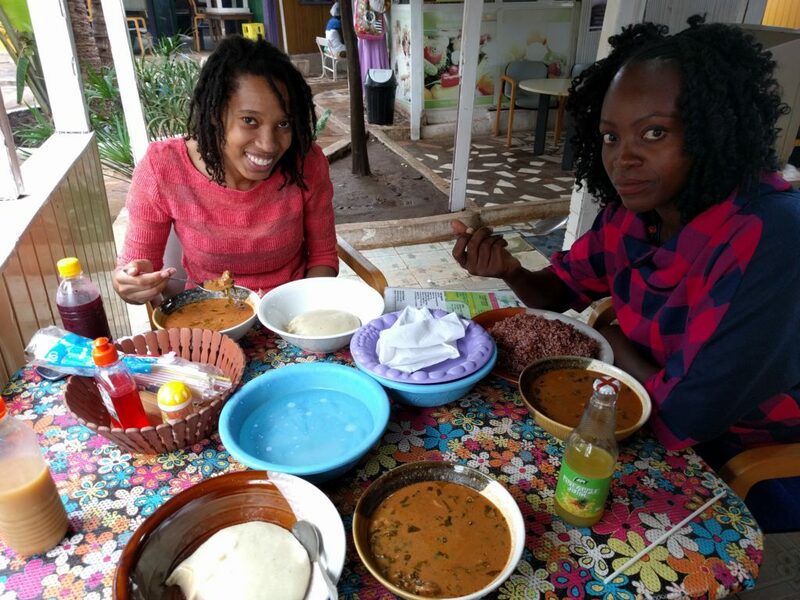 Then in Accra, staying at a vegetarian hotel/restaurant we found 2 vegetarian restaurants and a vegan restaurant, and Amanda found 20 vegans to interview in just 1 day. And then a fellow traveller happened to mention a Vegan Lodge, and I was able to visit Roots Yard Lodge on my way towards Togo. I hope that answers some of those silly questions back home about it being difficult or a luxury to be vegan in Africa? There’s lots of vegans here, and they aren’t just the relatively well-off, but a mixture of all sorts of people. The food is good value, nutritious and tasty, not to mention in large portions…a little too large for some of us! Sometimes even us vegans fall for the stereotypes and propaganda we are faced with at home – but the truth is that even here there’s no excuse for not making choices that are better for animals, health and for the environment. Actually there are lots of excuses and we’ve heard them all – from evolution to religion, from flavour to nutrition – but excuses and habits are what they are, not real reasons. Anyway I suppose a catchup is in order since I’ve let Ady and Amanda provide the input lately. So, where was I? 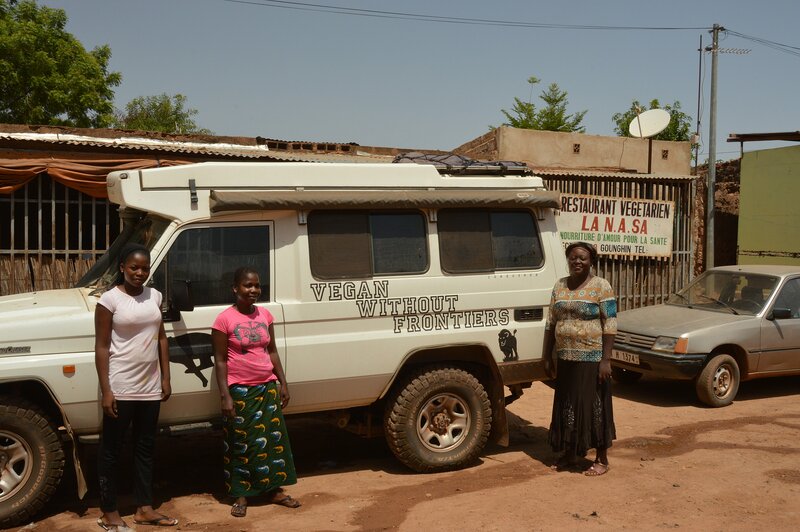 Oh yes – back on the Ghana visa trail on my way to Ouagadougou, which turned out to be an interesting experience – mostly due to finding NASA and chatting to Yasmine, the owner about how healthy, tasty, vegan food is very popular. The ginger juice was a great find as well – just what was needed to combat the raging thirst brought on by wandering around the baking streets. I also gave Troopy an oil change – by a professional at a garage this time, a guy with a great sense of humour who was recommended by Guillaume, the owner of Pavillon Vert where I was staying. This did however entail riding on the back of a moped through the streets of Ouagadougou holding on to a couple of 5 litre bottles of oil…wearing flip-flops and shorts. I think I have officially gone local. 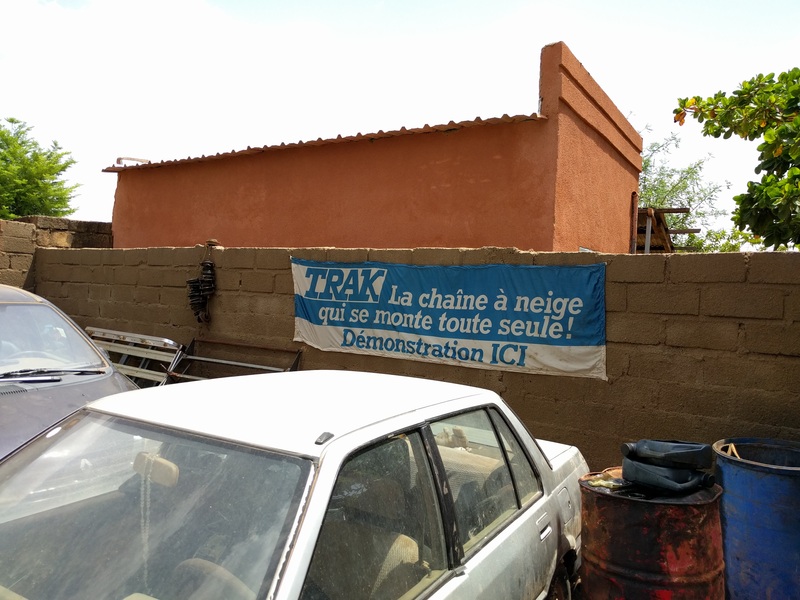 Snow Chain Demos at a garage in Burkina Faso…? After picking up my Ghana visa it was time to head South for the border, though not before having 10,000CFA extracted from me by a police checkpoint for the avoidance of serious consequences and delays should I not cooperate with their alternative unreceipted cash option. This sort of thing got worse through Ghana, and much worse in Togo and Benin. Corruption is one thing that is really putting me off coming back to West Africa. Appalling road conditions, clouds of diesel smoke that make overtaking impossible through lack of visibility, suicidal driving, and the general mess that people seem to make to live in once anywhere gets bigger than a hamlet…those are some others. The day I drove from the beautiful wilderness of Mole National Park, through gradually thinning forest, then no forest and sprawling settlements along the road, and into the stinking, dirty, insane world of the Kumasi rush hour – that day was nearly enough to make me pack up and go home. But then I found Lake Bosumtwe, and Cocoa Village, and spirits were restored. 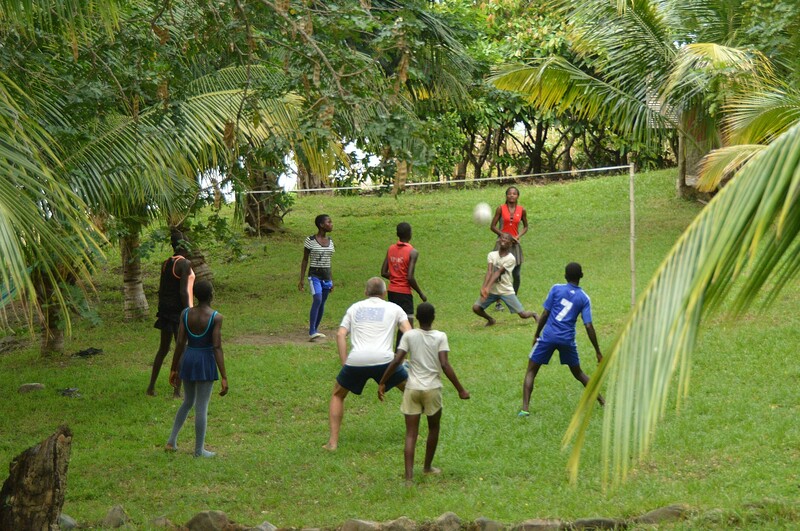 I camped in the lane outside the guesthouse and enjoyed the food they made, and in the morning woke to the sounds of the Slovenian guy who is managing the place busy coaching some local kids at volleyball. There are definitely 2 sides to humanity – the majority of negative impact through greed or laziness, and then the few dedicated people trying to undo the damage and change things for the better…but the ‘glass half-full’ outlook is under a lot of pressure here! 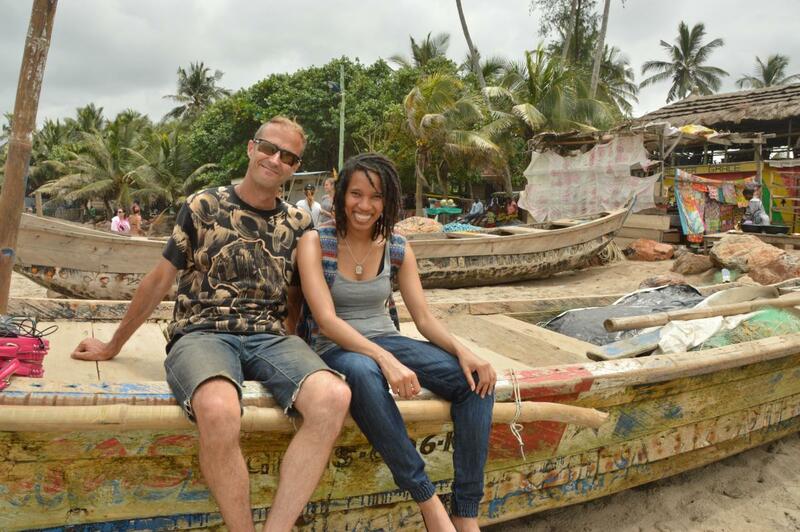 In Accra I made the rendezvous with Amanda, and met Ady, and we had a cool time seeing Vegan Africa and taking a couple of trips – but you’ve seen the video and read the post already? The main reason for there being quite so many vegans in this part of Africa is the high number of Rastafarians – though that is by no means the only sort of vegan here! I’m looking forward to seeing Amanda’s 365 Vegans interviews to hear the stories of a few of them. So after that it was time to move on – and by chance I’d been told about Roots Yard Lodge which was towards the border with Togo. What can I say about this place to do it justice? Run by Bob and Jaqueline in Bob’s home village near Lake Volta, it is a Vegetarian/Vegan Restaurant and Lodge – using local produce to make fantastic meals, including making their own tofu. But thats just the start. They are working on local projects – organising Re-Forestation, building and managing a skate park for the kids (Roots Rebel Sk8 Park), and this summer they are going to be biking across the UK from coast to coast to raise money to have proper toilets built for the local school. It strikes me that this is the level of Western/African cooperation that actually works – what you find here is absolutely the best of both worlds, because its personal and they care. So in the end I went out of Ghana on a high, though I wish I had stayed longer, but after a lovely couple of days, many excellent meals and a little paramotor flight, I headed for the Togo border. 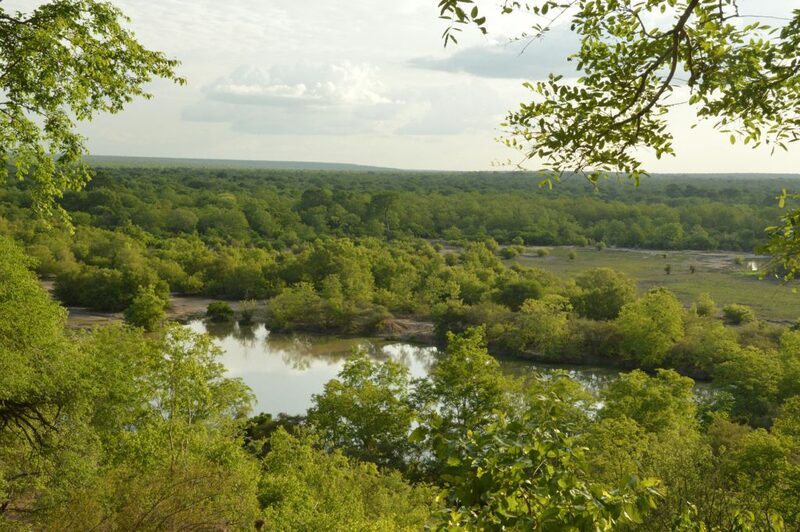 Not a lot of wildlife, no dragons, but indeed…here be vegans. Being Vegan in Ghana is a nice experience. You get to hear new and strange stuff about veganism, what people think it means, you meet people who think you’re weird, or worst, a fanatic. So let me introduce myself. My name is Ady Namaran Coulibaly. I am vegan, editor for Health Africa Magazine (the only Bilingual Vegetarian Magazine in Africa) and also the campaign manager for Meatless Monday Ghana. I had the opportunity to get in touch with Amanda who told me about her project (356 Vegans) and learnt that she was coming to Ghana for the first time, to interview vegans as part of her project, which I find really inspiring. She’s put so much passion and zeal into this; it’s hard not to want to support her. This project is special and I am excited to be a part of it. We agreed that I pick her at the airport. After a heavy downfall on Saturday night, Sunday morning was really cool. I left home at 7:30am to fetch my friend Amanda from the Kotoka International Airport in Accra. I got there a little late, spotted her and we hugged and exchanged pleasantries. Then we got a cab to the hotel and met with Jonathan. Jonathan lives an exciting life (I actually wish I was in his shoes), travelling around in his Jeep (called Troopy), and experiencing being vegan in different countries. 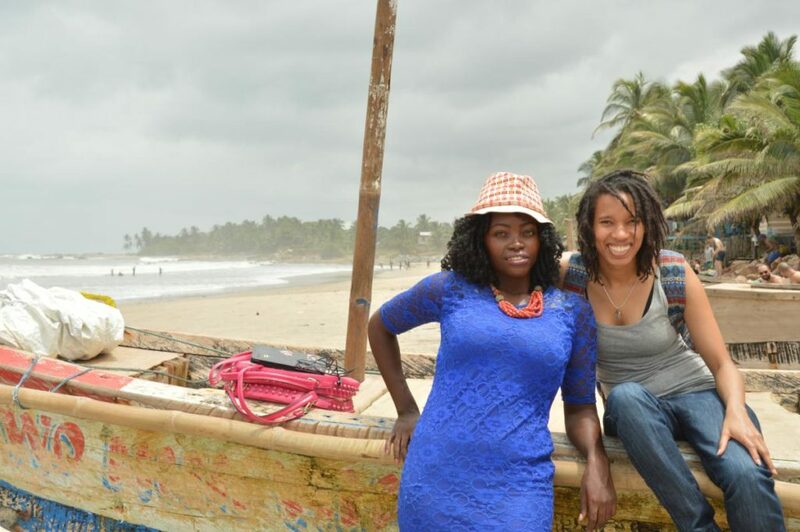 We wanted to have a day out somewhere, and we thought it would be nice to spend time at the Kokrobite beach in Accra, which is about an hour’s drive from central Accra. We boarded Troopy (I couldn’t wait to have a ride since I saw it on www.veganwithoutfrontiers.com) and off we went. The drive was peaceful, except for some drivers ignoring the street lights. It was a Sunday, and as most Ghanaians are religious and always go to church on Sunday mornings, there was little traffic on the road at that time of the morning. We got to the beach and stood by some fishing boats, just admiring the scenery. There were lots of white people; something Jonathan said was unusual in other countries like Mali, Burkina Faso etc, probably due to terrorism reported in the media. We stayed around for a while, taking pictures with Amanda, who was busy taking pictures of a dog. I think she’s got a soft spot for cats and dogs. The sea was really cool and chilled; we could not resist the temptation to swim in it. After sometime we had some drinks and talked about how nice the place was and other stuff. By the time we had made up our minds up to leave the place, the clouds had turned dark and it seemed like there was going to be some heavy showers. And oh! Barely five minutes after we had driven off, the rain started falling very heavily. Within twenty minutes the roads were flooded. Several vehicles were parked by the street, obviously because the owners preferred not to take the risk of driving through the rain. 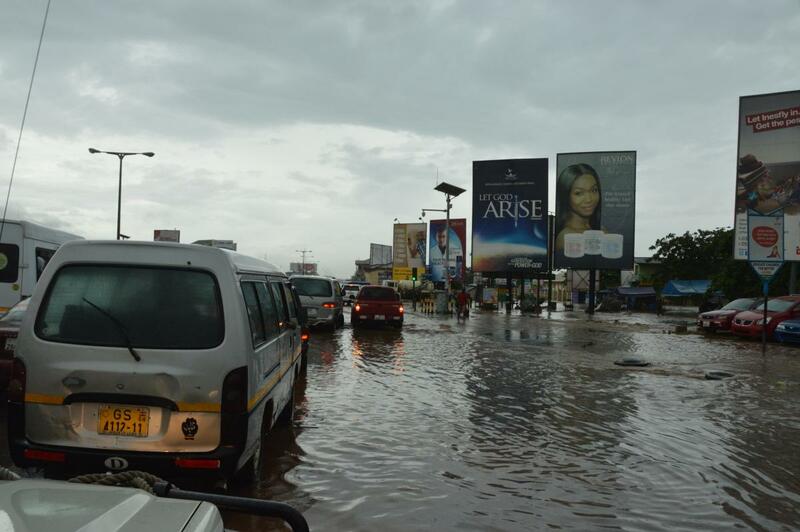 Such heavy rain in Accra usually causes a lot of damage. The gutters are small and open; as such people just use them as refuse dumps and throw in all sorts of items, especially plastics. When it rains, the water can’t pass through so it just comes on the road, and carries away cars and other items. This is a recurring phenomenon, but all the same, the Mayor of Accra won the award for ‘Best Mayor in Africa’ just last year. We got to a point of the road where we would have gotten stuck, but for Troopy the Jeep. We were able to drive through volumes of rain and made our way back to the hotel, and to Asaase Pa around 4pm to have lunch. Asaase Pa is a Twi word that means ‘Good Earth’, and this restaurant is the first Vegan restaurant in Ghana, and was set up 18yrs ago. According to the owner, Brother Kwasi Adu, it was difficult getting clients because the concept of veganism was a new one but gradually he was able to create awareness about its benefits. Lots of people patronise vegan food now, thanks to his efforts. He was very friendly. Amanda ordered ‘Zinger’, Jonathan got some ‘Royal Ginger’ and I got some pineapple juice. Zinger is made from a mixture of Hibiscus and ginger. Burkinabes and Ivorians call it bissap while Ghanaians call it sobolo. Amanda wanted to try a local Ghanaian food, fufu. I suggested she tried it with groundnut soup which is my favorite. Finally, Jonathan and Amanda had fufu with groundnut soup and I had brown rice with groundnut soup. The food was good. 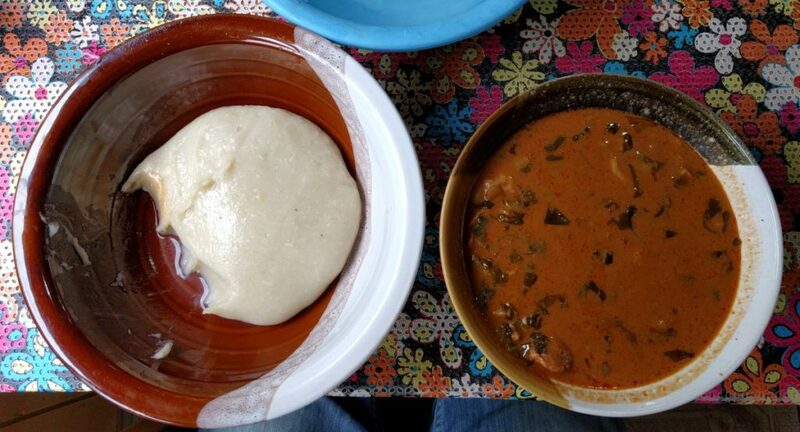 Fufu and Groundnut Soup -Very Filling! 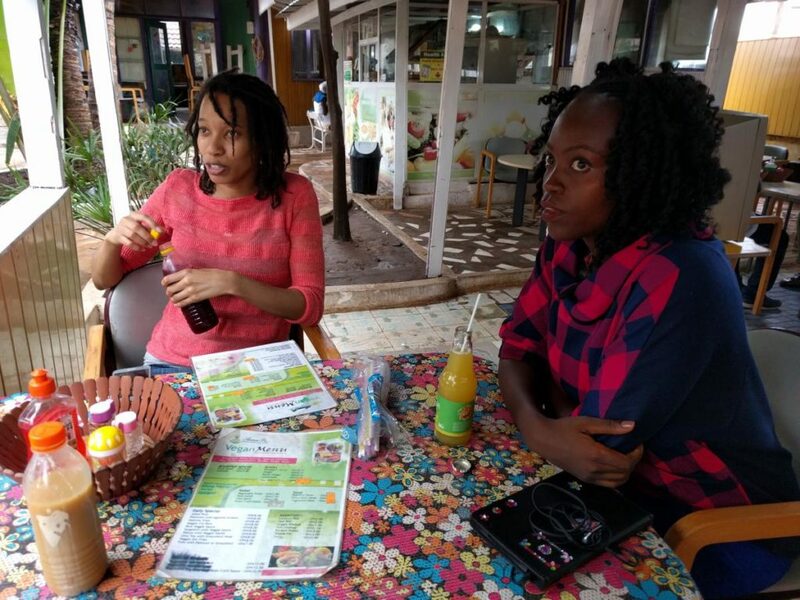 After we had eaten, Brother Kwesi Adu introduced some vegans to Amanda, and although initially she had planned to start the interviews for 365 vegans the next day, she started right away. I was third to be interviewed, and really had fun during the interview. Can’t wait to see it on 365 Vegans Youtube Channel!! My day was just perfect. Thank you Amanda and Jonathan for the great time, for what you are doing out of your passion for veganism and your vegan journeys which are inspiring. Looking forward to spending more time with you guys!